I have a habit of sorting the books I read into mental categories or “bookshelves.” One is a list of the perfect rainy day books (Shadow of the Wind, One Hundred Years of Solitude, The Meaning of Night). Another is the sensory bookshelf (Perfume, Blindness, The Bells); a personal favourite is a list of the ones that are so stellar that they leave you psychologically/emotionally/cognitively crippled for days weeks (Invitation to a Beheading, Never Let Me Go, Notes from Underground). One of the bookshelves I keep to ensure that I’m challenging myself and staying ambitious is my list of Trophy books. For these books, it takes months or years of substantial cognitive effort to get from the tentative first pages, through the depths of expansive content, to the satisfaction of the final pages that wrap up nothing less than a journey: Atlas Shrugged, Ideas, War and Peace. Right now I am working my way through a list of titles that are not quite Trophy Books on their own, but to me the combination of the three represents a valuable reading list with long term learning implications: The Sleepwalkers by Christopher Clark, 1914-1918 by David Stevenson, and The Second World War by Anthony Beevor. While military and political history is over-emphasized in traditional education (as opposed to social history or the history of science, for instance), it is still a weighty topic that dictates the formation, fragmentation, and restructuring of the societal frameworks within which populations live and function. I was thinking this on June 28th of this year, the centenary of the Sarajevo murders that sparked World War One, and came to the conclusion that there is no better time to begin learning about one of the vastest, most disastrous, and most complex series of interconnected conflicts of our time. I am now close to finishing The Sleepwalkers, book one of my journey. It discusses the factors that morphed into World War I, providing a backdrop of political, social, and anecdotal perspective. Beyond this, book two will further discuss the events of the war as they occurred, and book three will illustrate the causes and events of the Second World War. Here are the things I am hoping to take away from the chronological combination of the three books. 1. Perspectives. We are taught only our country’s history in school, not world history. I am interested in the perspectives from Russia and Germany as mobilization for WWI began, and in learning about the African and Pacific theatres of WWII. Additionally, in selecting the above books I have tried to pick those that would be least biased. The author of The Sleepwalkers, for instance, has also written a comprehensive book on the history of Prussia. While it has been pointed out that he speaks from a point of view that assigns less of an aggressor role to Germany than most views do, his book remains in-depth in tone from all sides, and exhibits no inclination to support or condemn any player in the complex environment of pre-war Europe. 2. Cause and effect. There was no linear path to the Wars, as there is rarely a linear path to any event. Reading about one of the most complex events of recent history provides ample opportunity to dissect it and ask how various events and elements influence and cross-influence one another. For instance, Clark has asserted that the purely cultural inclination to accept war as an unavoidable eventuality played a large part in the acceleration towards WWI. As another example, Russia was literally minutes away from full mobilization against Austria-Hungary and Germany when the direction was reversed to issue a partial mobilization instead. The reason? Tsar Nicholas II received a telegram from his third cousin Kaiser Wilhelm II (“Willy,” to Nicholas) reminding him that it would be unfortunate for both parties if Russia proceeded to mobilize. The order was reversed back to a full mobilization less than 24 hours later. Power was held by individuals at all levels of government, by cultural norms, and by structures within which polities operated, among many other elements. It is fascinating to trace the ebb and flow of the influence of each one of these. 3. Framework for current events. In hindsight it is so tempting to dismiss events as avoidable and comment on humanity’s ability to deal with conflict of interest in a more mature and rational way now, versus before. While that is true to an extent (for example – we have the United Nations as of 1945), mistakes are often repeated and having the historical context to place them in makes identification of current errors easier. As a Ukrainian I am currently exasperated with the idea that having “common heritage” or being “blood brothers” is reason enough to invade and annex a portion of a neighbouring country. I see now that this was a standard argument for some nationalist parties in the early twentieth century, as well. Understanding historical events such as these can (hopefully) help me formulate my frustration and indignation more efficiently, furnishing it with relevant facts, taking it out of the realm of emotional response and into the area of political argument. Besides this specific example, understanding recent history is also a way of being a well informed citizen. The catastrophic and lasting impact of World War One and World War Two have changed us as people, and knowing their effect can help in understanding why we function as we do. Further to this, and perhaps another big reason that I started learning about this topic – there is a multitude of tangents to be explored for further learning. The two military conflicts of the twentieth century substantially informed further politics (the Cold War), economics (the Great Depression), demographics (the Baby Boom), and a vast variety of other aspects of living. Here is, then, a springboard for understanding much of modern history as a whole. 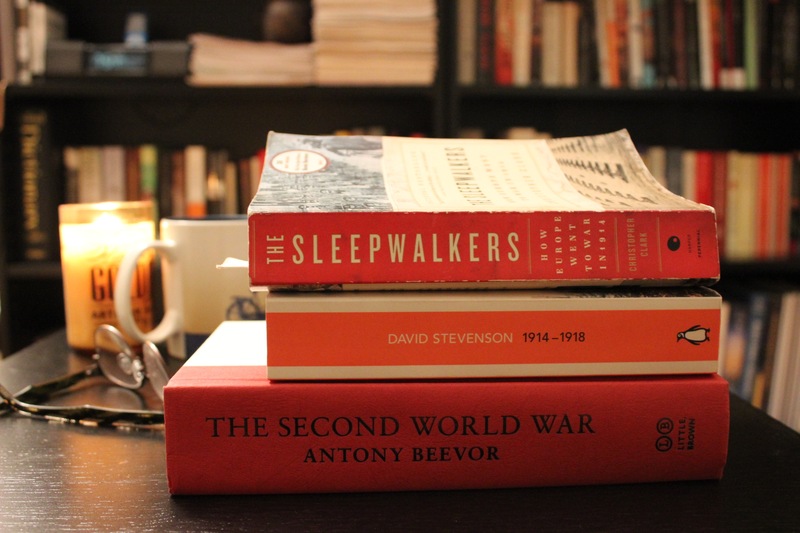 Tags: #WWI, #WWII, 1914-1918, Anthony Beevor, Christopher Clark, David Stevenson, France, Germany, Military History, Non-Fiction, Reading, Remembrance, Russian Literature, Second World War, The Sleepwalkers, World War One, World War Two. Bookmark the permalink.